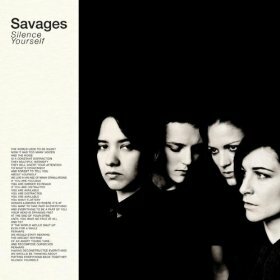 I didn’t plan on liking Savages. I’ve been so sick and tired of the post-punk resurgence as of late for its continuing lack of creativity, that any time a band with a similar aesthetic comes around, it’s enough for me to write them off instantly. But Savages is something far more authentic. This is very much a heavy punk band – as indeed some of the best early post-punk groups were – with just the right amount of dark mystery for good measure. The crunchy bass lines and, at times, primal drums are the foundation for loud, feedbacking and vicious guitar riffs, setting the bed for Jehnny Beth’s howling vocals. This is a bold, real band bashing it out, a far cry from some of their more sterile peers. At times it’s reminiscent of early Siouxsie and the Banshees (especially the vocals), and for sure Bauhaus or The Birthday Party. Despite the clear influences and obvious genre touchstones, “Silence Yourself” is the work of an exciting band whose performance is surprisingly refreshing and intensely powerful.